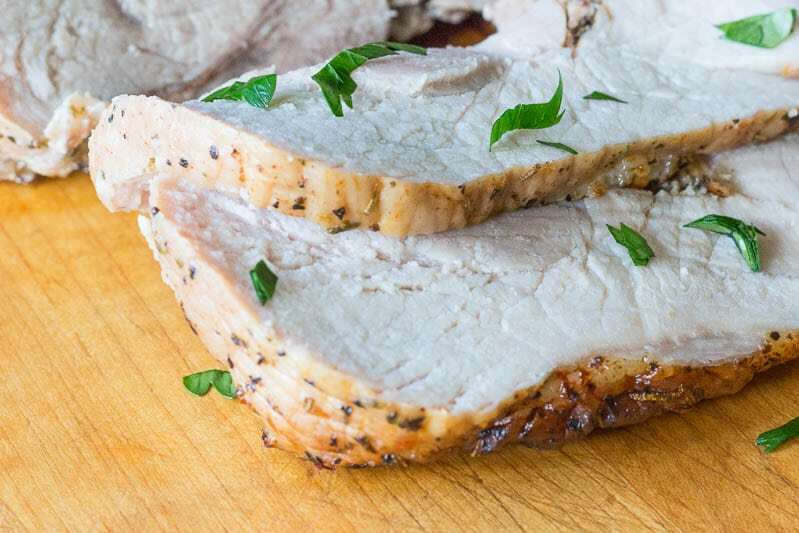 Pork sirloin roast is tender, flavorful, and incredibly easy to prepare! 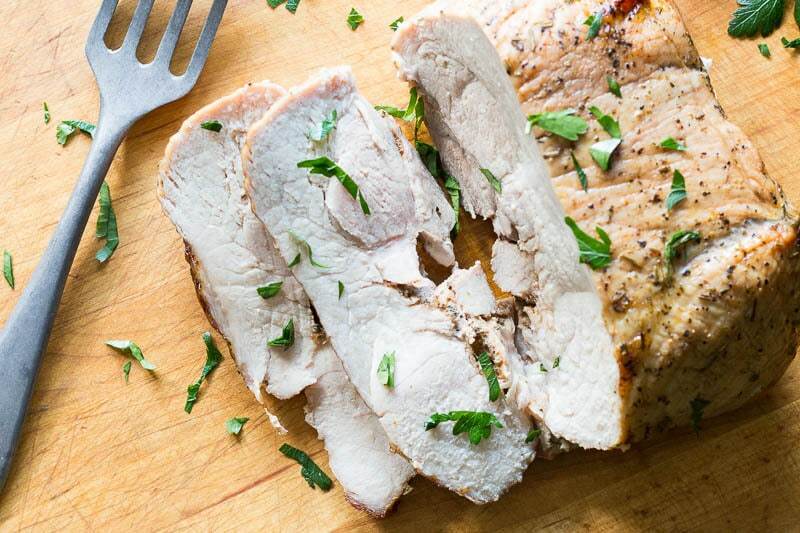 Make this delicious cut of pork the centerpiece of your dinner table. 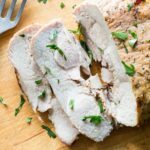 I have spent an unbelievable amount of time reading about different cuts of pork, so that you don’t have to. Feel free to thank me with gold and jewels of your choice. I’m pretty used to cooking the long, narrow cut called the pork tenderloin. However, after becoming fond of roasting very large hunks of meat, I decided that I’d like to scale up to the heftier pork sirloin roast. The neat thing about a pork sirloin roast is that it’s one of those set-it-and-forget-it cuts. The prep time is well under 30 minutes, and after that, you simply pop it in the oven and go about your business. Go catch up on watching Star Trek or something. Or maybe that’s just what I do. Line your roasting pan with foil for easy cleanup. No roasting rack? No problem! Pull out a long piece of aluminum foil and crunch it up into a loose spiral. Place the foil spiral in your roasting pan. Voila, instant roasting rack! Leftover pork roast makes excellent sandwiches. Or, toss with cooked rice and vegetables for a second day’s dinner. Preheat the oven to 375 F. Place a roasting rack in a shallow roasting pan. Place the pork sirloin on the rack. 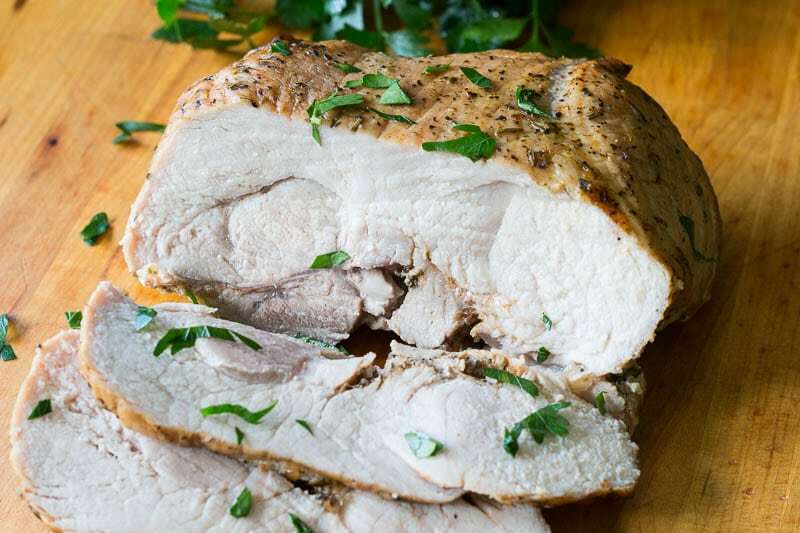 Roast in the preheated oven for 27-32 minutes per pound (approximately 1 hour for a 2 pound pork sirloin roast). Remove from oven and check the internal temperature with a meat thermometer. It should reach 160 F.
Let the roast rest for 10 minutes, then slice across the grain to serve. Garnish with chopped flat leaf parsley, fresh ground black pepper, and a few drops of fresh lemon juice. I love these roasts! They are so versatile and full of flavor! I usually cook them in the oven, but sometimes I will though them in the crock pot with some veggies and just let them go all day. They make for one amazing pulled pork sandwich! I just picked up a few of these last week and plan on making them for dinner next week. I like to throw them in the crock pot when I have a busy day. It is great to come home to a tasty dinner. Exactly. I hear from a lot of people that they like to make this cut in a crock pot. Oh man! I love oven roasted pork! I also enjoy using the crock pot to cook it. That Garlic and Herb Roast looks amazing. I am going to have to pick one of those up! You’ll laugh, but I don’t own a crock pot. I keep saying I’ll get one, and I never do! Okay, now I’m hungry! You can see just how moist the pork sirloin in the up close picture. My hubby, kiddos and I will enjoy this for dinner this weekend. The sandwiches will be just as tasty, I’m sure. Smithfield products are amazing, I love how easier they are to prepare. 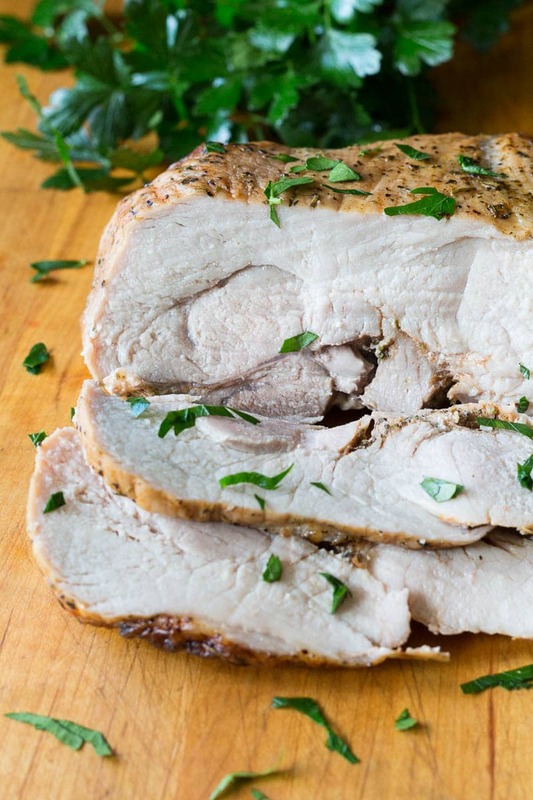 My husband roasted pork and will love this recipe. Thank you for sharing it! Thanks for stopping by! I hope you enjoy the recipe! Perfectly cooked! We love pork at our house!!! Yes! Finally something about 5 pound tenderloin recipe.